Who are the people in charge and what are their qualifications? The Director is a New York State Certified Teacher with many combined years of camp experience. In addition many of our camp counselors are also certified teachers. We are conveniently located in Hicksville at Our Lady of Mercy Elementary School. Our Facility is equipped with an air conditioned gymnasium and Cafeteria. 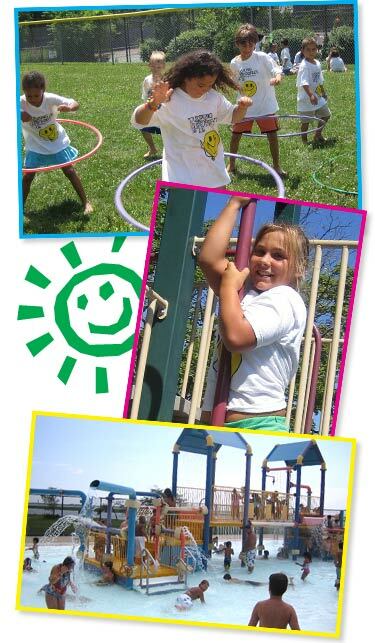 We also have spacious classrooms, outdoor basketball courts, and a fenced in play area for our younger campers. We are also within walking distance of a large park called Hidden Park with a playground, spacious fields and Basketball courts. In addition we swim at Cantiague Park three days a week which is also located in Hicksville. Absolutely! Each camper is covered through our medical and liability insurance. Yes. The licensing agency is the Nassau County Department of Health, which visits us several times during the summer to ensure that we are in compliance with all state codes. We are also inspected by the American Camping Association. All Young People’s Day Camp Directors are both CPR and First Aid Certified. In addition, we also have two Emergency Medical Technicians on staff and a Doctor always on call. The majority of our staff is made up of College students and certified teachers. All of our counselors are people who are either known to us as former campers, or individuals who have been recommended and have impeccable credentials. We believe our staff is the finest in the business. Each counselor is checked through the state data based system as well as our camp administrators checking references. The campers are transported by buses, which are driven by professional certified bus drivers. While many camps lease buses and have the counselors drive them, Young People’s Day Camp of Nassau believes that it is much safer to leave the driving to the professionals. We use Baumann/Acme Bus Company. One of the largest and most trusted bus companies on Long Island. Young People’s of Nassau does offer a lunch program for a nominal fee. Lunch Menus will be mailed home to our families before the camp season begins as well as each Friday during the camp season along with a newsletter. Campers who do not participate in our lunch program are required to bring a sensible lunch and drink on a daily bases. Lunch is kept fresh in our on-site kitchen. We do have “emergency peanut free lunches” and a “canteen” which is available at snack time for a small cost. Please know that no camper will ever go without lunch. Upon registration, a deposit is required. The balance is broken up into a series of payments to make payments as comfortable as possible. There are no registration fees or service charges (except for a returned check fee of $10). What if I have to get in touch with you or my child during the camp day? No problem! Call or Text Camp Director Brendan McCaffrey at (516)650-1856. You can also call the main office at 1-800-933-YPDC. Someone will always be available. For all transportation questions call our bus company Bauman/Acme at (631)789-0008.